We could not have asked for a more beautiful day for our PFA 2nd Annual Small Ball Restricted Singles tournament, with twenty-five players battling for the crown. This tournament did not include all of the top singles players in the game today since their entry was “restricted.” But there is no doubt the field was very talented, with such players as 2017 defending champion Alex Cherry, Will Rolon, Peter Lloyd, Vito (Boom-Boom) Weng, William (Wheels) Chavez and many others. But the surprise of the tournament was Nicholas Bacchus, who played great and battled all the way to the finals! However, he was not able to deflate Willie Wheels, who has made a strong statement in the last two singles tournaments, both big and small ball, as one of the top singles players! The crowd was fantastic, even stopping play on the other courts to support the finals match. Thank you guys! I have quite a few thank-you’s to give out for the success of this tournament. But for me, the biggest #Shoutout goes to Ray Gaston! This man donated, water, food, tables, etc., but more importantly, he donated his time from 7:20 AM all the way to the end. Ray, without you, the tournament would never have been as successful! Thank you! 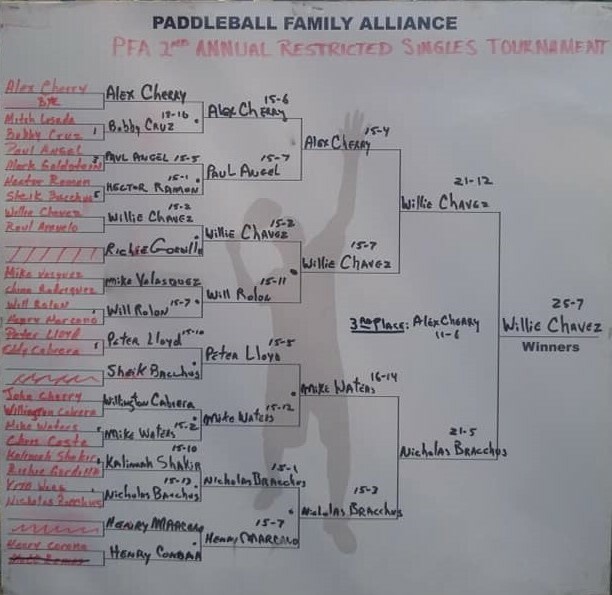 I also want to thank Gearbox for their continued support of the PFA, in particular for our Youth program, and everything they do to promote the sport of Paddleball Thank you to Jonathan Clay of Rollout for the discount on the shirts and CricketZone USA for the trophies discount! Thanks to EVERYONE that called games and lines, in particular to Sweet Susan Stephen who AGAIN did a great job reffing and contributing to the success of the event. Sue has become a perpetual figure at almost every event, giving her time unconditionally. Love you Sue!! Thank you to Allen Eades(Shorty) and Ray Sanchez for the photos and Will and Alex for the FB Live! Last but not least, THANK YOU to all of the participants that played their hearts out and supported this event. For the game to grow it is critical we continue to support all of Paddleball, both Big and Small Ball events. Also a special #Shoutout to Kalimah Shakir for going mano-a-mano with the boys with no handicap this time!! This lady is a lioness on the paddleball court! Last year she came in 3rd place and yesterday made it out of the first round with a hard fought victory! It was great to see Welingtom Cabrera comeback to paddleball and competition! Also Mitch Losada is now competing in tournaments. These are all good signs the sport of paddleball is on its way back. Congratulations to everyone that placed and of course to the winners! See you all at the upcoming events!